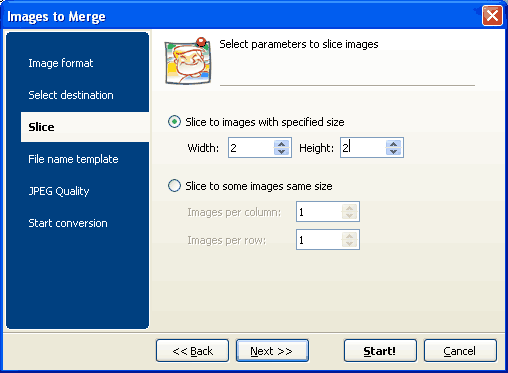 The tool you need to slice and merge images. Total Image Slicer does what it says: it slices images. For example, you scanned a book and got a double-page spread in TIFF format. Image Slicer will help you at one time to slice the file into two separate pages and convert to the format you need (JPEG, PNG, BMP, GIF, PCX, TGA) or leave it as it is (in TIFF). 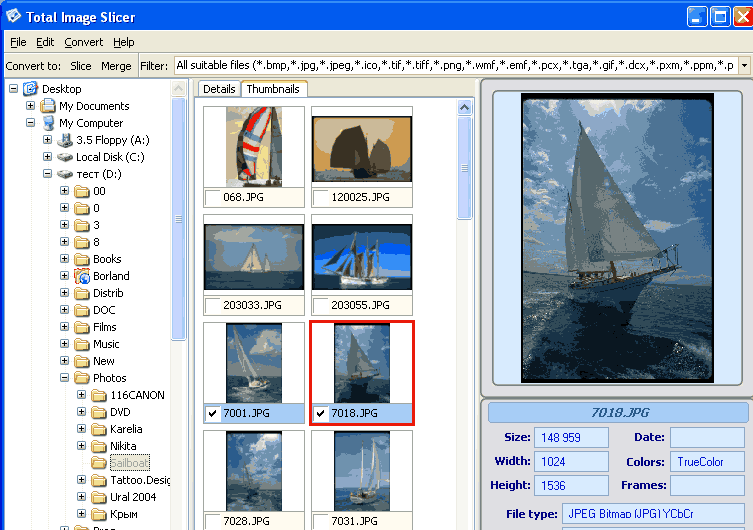 The tool allows you to slice images to specified dimensions or to a table (you set the numbers of rows and columns all of which will be of the same size). But that is not all. Image Slice can also merge images. 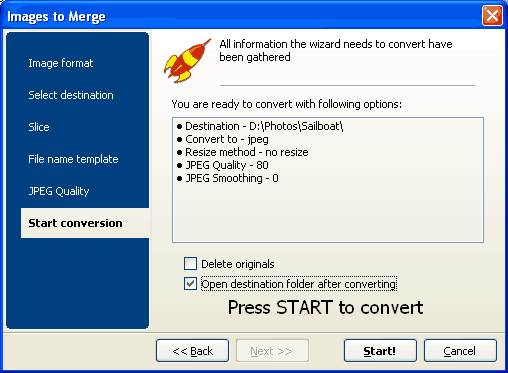 Just select the images, press Merge button and set the number of images per width and per height. For JPEG images you may define quality and smoothing. All operations can be done via command line. Get your free evaluation copy now - no fee, no obligations. You will try Image Slicer for 30 days to know if it meets your wishes. Once paid you get all the upgrades and tech support for free. "I have only been using the slicing feature of this program for a brief period and I can say that it works perfectly for what I need at the moment, very quickly and easily! Before finding this software I had to make a grid on top of each image and crop each section...which is a very long process when dealing with very large image files (20x20 inches). Thank you for creating this program, I am extre appreciative!" "On the whole I am QUITE PLEASED with TotalImageSlicer. It has saved me an enormous amount of time putting together the image maps. This was a process that I had to do by hand in Photoshop." "I was originally dicing up images using customized grid sizes (the parts the images were diced into were different sizes) using Jasc Paint Shop Pro 7 or 9 (they probably don't even make these programs any more since Corel took over everything at that company). The dicing would convert the images into gif files (I could not keep them as bitmaps), but the decrease in color (down from 24bit to 256 colors) was very poor. If there was an area I wanted transparent, I would then batch process the files to apply the transparency, but I had to pick out the files that contained the transparent color... otherwise, it would set transparency to colors that should not be transparent. I also had to rename all of the files (in a batch) to match the formatting I wanted. With your program, I was able to dice up images significantly faster and save the pieces as bitmaps."